The release of the seventh Spacing is our most ambitious to date -- we outline the 10 most important public space issues Toronto faces so that our politicians will wake up to a number of urgent matters: our dwindling urban forest; the spectre of Peak Oil and how the city is dealing with smog; how Toronto is mismanaging development putting unnecessary strains on our neighbourhoods; how the city is selling its infrastructure and getting very little in return; and 45 Things To Do for the next city council. The issue also features articles on hanging out in cemeteries, riding your bike with headphones on, who invented Toronto's ring-and-post bike rack, and a detailed map on how to get out of the Don Valley. 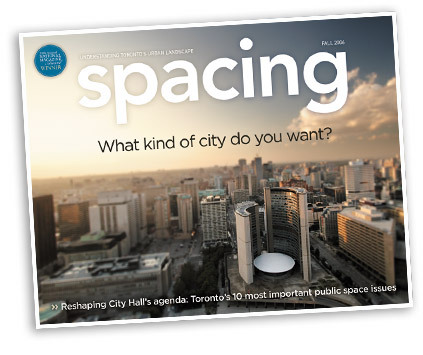 Contributors include: Ed Keenan (Eye Weekly), James Bow (Transit Toronto), Sarah Hood (co-author of The Unknown City), Mike Smith (Now magazine), cycling activist Steve Brearton, Paul Carlucci (Eye Weekly), Shawn Micallef of [murmur], Sean Lerner (TTC Rider Efficiency Guide), plus articles by Spacing editors Dale Duncan, Dylan Reid, and Matthew Blackett. 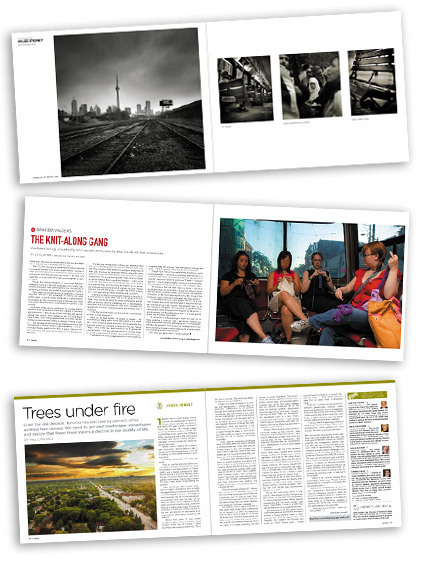 The pages come to life with the work of Sam Javanrouh (Daily Dose of Imagery), Rannie Turingan (Photojunkie.ca), Adam Krawesky (inconduit.com), Bouke Salverda (aidanfotos.com), Payam Rajabi (colourblind.ca), illustrators Fiona Smyth, Julia Breckenreid and Joe Ollmann. You can pick up the issue in these stores across Canada. You may also want to buy a copy or a subscription by clicking here.